WHEELS brought you exclusive first news of the Datsun 1200 back in March, then Big Deal in on the home market. Now it's here and has hit hard. The opposition is learning how to duck. Nissan's groovy wheels have a bigger slot to run in for 1970. Already the "groovy wheels" image for the smallest Datsun range, the 1000 series, has caught on as Toyota dealers around australia has been niggled by the strong small-bore Datsun march forward which is eating into the jealously-guarded Corolla market. The Datsun 1200 is an inflated 1000 -- all around. It is bigger, with more performonce and comes in three models, the coupe, sedan and station wagon. The 1200 series was released in Japan earlier in the year as reported by our correspondent, Jack Yamaguchi. In Australia the coupe and station wagons will be imported, the sedans locally assembled at Press Metal, Enfield, Sydney, and Motor Constructions, at Clayton, in Victoria. 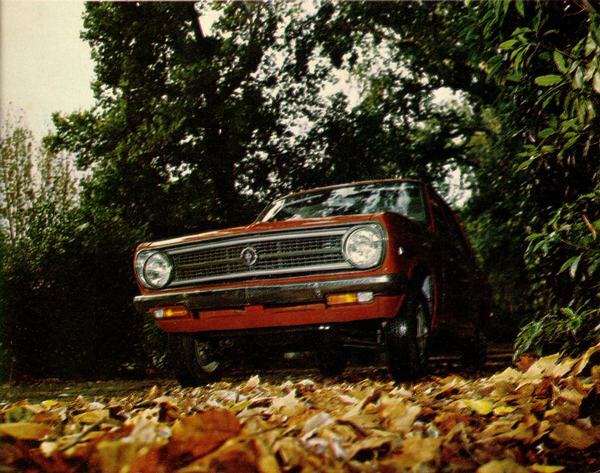 The 1200 boyd is bigger, which makes it more livable, and in the Corolla class. Interior room is generous with curved side glass and a longer wheelbase for more legroom. Nissan claims the 1200 as "all new" with a "carved front grille" for "an aggressive look of power". The 1200 engine is a new block with five bearings, an increase of 7 bhp to 69 and torque up from 61.5 to 70 lb/ft at 3600 rpm. The extra 200 cc puts top speed up to a claimed 93 mph, with added smoothness and low speed tractability. Transmission comes in two packages, the four speed all syncro box with central floor shifter and a three speed automatic. Top model in the range is the fully equipped coupe similar to the current fastback. 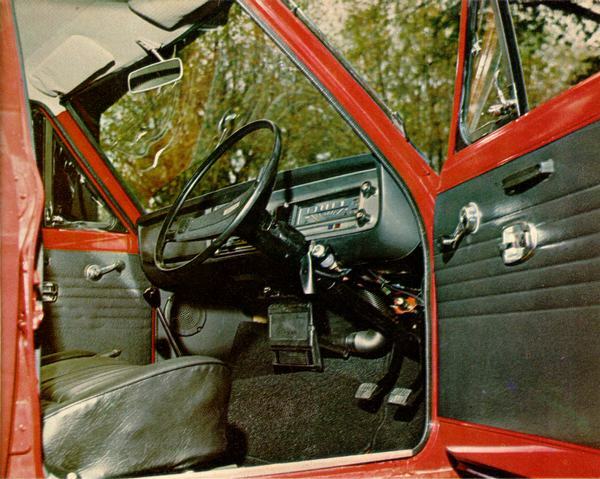 It has reclining seats, radial ply tyres, disc brakes, a tacho, radio, heater-demister and is carpeted. Popularity of the four-door model has encouraged Nissan Australia to make it the only sedan and it comes complete with all the coupe gear minus the tacho and reclining seats. The five-door wagon features 53 cubic inches of load space with the rear seat folded down. The new engine specifications are very close but the re-styled Datsun body could give the Nissan 1200 a wee edge over the Toyota product. The range hit Australian show- rooms on June 1 -- and you can bet the first investigators will be the local salesmen from the Toyota and Ford dealers. Current market expectation for light cars is a 40 percent share which at present the Japanese makes have a firm foothold in -- and they're not about to let go. Toyota is producing and selling to its ceiling of 7500 units per annum and the new 1200 models for Datsun will possibly see "groovy wheels" in the unenviable position of not being able to meet demand. Newsflash:Toyota Japan has just released a completely re-styled Toyota 1200 Corolla range -- aimed to resist the Nissan-Datsun revamp. Prices, just released are: Standard 4-door $1885; Deluxe $1998; deluxe T-bar auto $2220; 2-door fastback $2298; 5-door wagon $2115. 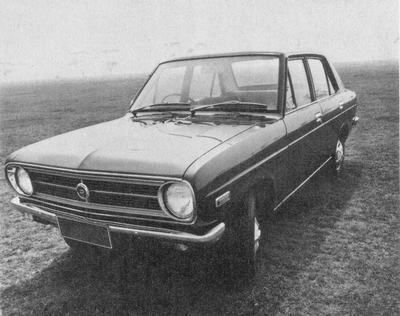 The bold new face of the Datsun 1200 has already given chief opposition Toyota salesmen a fit. Interior is plush, equipped to satisfy. Cockpit design is thoughtful and practical, though basic. Autumn leaves reflect the new image of the re-beefed sedan -- but Toyota Japan has already answered with a new-Look Corolla. This page has been accessed 1,275 times. This page was last modified 13:27, 9 February 2019. Content is available under Datsun 1200 Club.